Diamond Details: 111 Marquise cut and 15 round brilliant cut white diamonds, F color, VS2 clarity and excellent cut and brilliance, weighing 19.70 carats total. Gemstone Details: 1 cushion cut tanzanite of excellent hue and even color distribution, weighing 4.55 carats. Measurements: The drop measures 22mm x 15mm. This exceptional 18k white gold necklace, designed in Italy, features a cushion cut tanzanite of very fine hue, tone and saturation with even color distribution, beautiful clarity, excellent cut and brilliance, weighing 4.55 carats total with 111 marquise cut and 15 round brilliant cut white diamonds of F color, VS2 clarity and excellent cut and brilliance weighing 19.70 carats total. 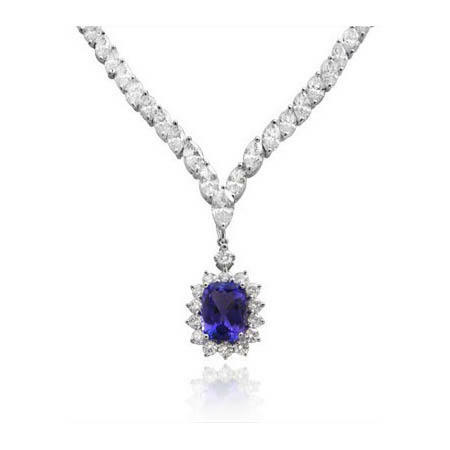 The tanzanite and diamond drop measures approximately 22mm x 15mm.